One of my friends came to visit from Korea during his two-month-long winter break (now I want to study in Korea too), so I thought it would be fitting if we went to a Korean-operated sushi restaurant. 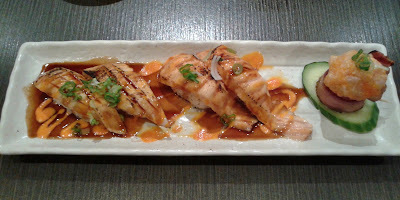 Okay, it was more like many of our other choices in the vicinity were closed, so we just ended up going to Sushi Oyama. With a very large dining area and a dazzling water fountain, what could go wrong? Also, they must have tried to lure me in by adding a Nigiri Delight section to their menu. Needless to say, their strategy worked. 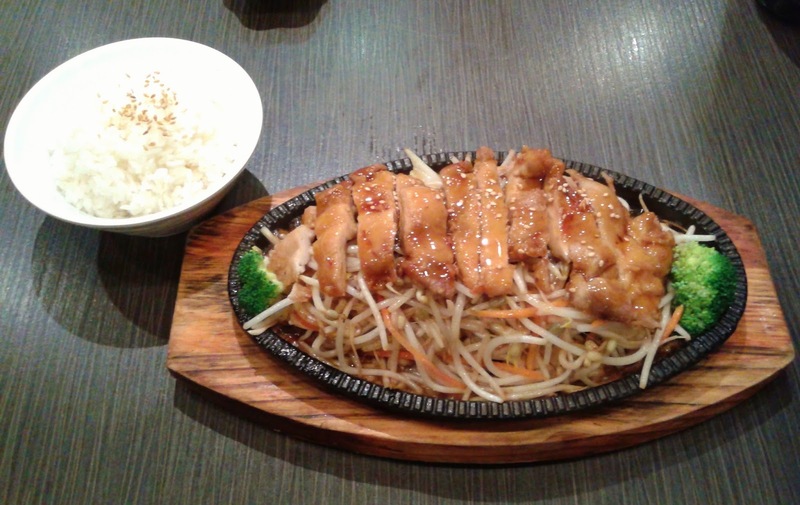 Surprisingly, my Chicken Teriyaki arrived first, and it was decent. The light sprinkle of sesame seeds added depth to the flavours, and the chicken was sufficiently tender. There was also a distinguishing sweetness, as if the chicken was coated with a thin layer of honey. The stir-fried bean sprouts were savoury, and they were served in a very generous portion. Next came my favourite food: the aburi nigiri from the Nigiri Delight section (for less than $2 a piece!). Served with more sauce than fish, the aburi nigiri actually tasted decent, though this was more due to the sauces than the fish itself. They are lucky that I award absolutely no points for authenticity. The Aburi Toro Nigiri was slightly overdone and not as juicy as I had expected. However, the Aburi Salmon Nigiri was soft with a slight smoky flavour that was accented by copious amounts of spicy mayonnaise. I let my friend have one of the Aburi Salmon Nigiri, and he liked it so much that he decided to order some aburi nigiri for himself. At the far right is the Bacon Eye, which consisted of bacon, chopped scallop, cucumber, green onion, and mayonnaise. It may be hard to see, but there is actually a toothpick holding everything together. I almost had a prickly accident with it myself, so I think it should come with a sign that says "Warning - Choking Hazard: Not for children under 30 years." Aside from that, the Bacon Eye came with plentiful bacon and some soft, creamy scallop. The individual items were decent, but they didn't really work together (nor was it easy to eat all of the ingredients together). I ordered the Awesome Roll to see how it would stack up to Sushi Town's Awesome Roll. This one was slightly more expensive, but also more massive and certainly spicier. Despite being large, the individual pieces retained a pleasant soft texture, and the lightly seared salmon on top was delectably smooth. As a former regular of Sushi Town, I can attest that on one of Sushi Town's good days, Sushi Town's version is better, but on one of their bad days, this would be the winner. While I was busy eating and writing, my friend enjoyed two Spicy Tuna Rolls, and based on my previous visit, I can confirm that spicy tuna is one of Sushi Oyama's strengths. However, getting the bill correct is not one of their strengths. The service was quite friendly, but they kept mixing up the items on my friend's bill and my bill. They brought us about five different sets of wrong bills before they finally got it right. I'll admit that our various orders of nigiri sushi sort of exacerbated the problem. Is this why they charge so much for fancy nigiri at so many other restaurants?